In addition to roofing, siding and windows and doors, Tailored Exteriors offers a wide range of other home improvement solutions. Below is an overview of the services we offer. If you would like an estimate for any of our home repair or improvement services, contact us to schedule your on-site consultation with one of our professionals. Whether you need to install gutters on a new home or replace your old gutters, Tailored Exteriors offers expert gutter replacement and installation. Rust, holes, cracks, sagging, peeling paint, and puddles of water around your foundation are all signs that you might need to replace your gutters. 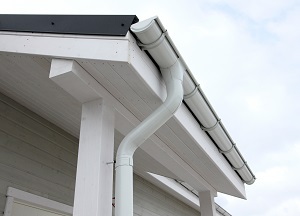 We install many different types of rain gutter systems and use only the most durable materials. During your consultation, we'll go over all the gutter options and materials and help you find a solution to fit your budget. Tired of cleaning your gutters year after year? When your gutters get clogged with debris, water can back up and spill over the edge of your gutters next to your foundation or get underneath your shingles and cause leaks. We offer effective gutter protection products that will keep leaves and debris out of your gutters while still allowing water and melting snow to drain properly. We can inspect your seamless gutter system to check for leaks, damage or other repair needs. We'll then discuss repair or replacement options with you to determine the most cost-effective plan for your home. With professional gutter repair, replacement, and protection solutions, we'll have your gutter system working properly in no time.